IDC (International Data Corporation) has described that there are three application development platforms[ii]. 1st Platform: Centralized IT, Mainframe. 2nd Platform: Decentralized IT, Lan/Internet Client. 3rd Platform: Democratized IT. Democratized IT is an environment that enables anyone to do the work that historically only IT did. Ability to integrate SaaS with back-office systems. Ability to facilitate citizen Integration. Ability to migrate production workloads from a private, public or community cloud to a separate private, public or community cloud provider on demand. Most applications system today are now delivered according to a Hybrid IT operating model. Almost all are accessible via mobile devices and most back office systems are now integrated in some way to cloud services. Following is an example of a Hybrid Application stack. There are thirty applications in this system. Seven are in the cloud, the reminder are the customer’s data center. There are four different communication protocols. 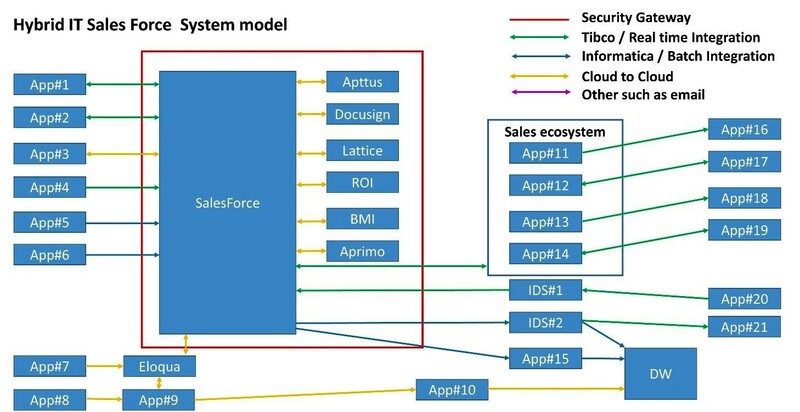 It is important to determine where each workload in the Hybrid Application Architecture is best facilitated in order to address location and integration challenges . Determining where each workload in a Hybrid Application Architecture is best facilitated has several challenges. Challenge 1: How do you decide where an application workload should be placed? The challenge in developing a Hybrid Application workload architecture is where should workloads be placed. The first step is to classify the workload for example, IT resources with a utilization that grows or shrinks constantly over time experience “Continuously Changing Workload”. By identifying this pattern on can apply the correct architecture to the deployment model. Determining what workloads should remain in a traditional data center, and what workloads should be migrated to a Cloud Service requires some in-depth analysis. Location and capacity of data movement. Workload Patterns[iii] describe workload experienced by applications. Workloads Static as a process to describe workload experienced by applications. The service can be static, periodic, once in a lifetime, unpredictable, continuous changing, or high growth. Deployment models employed by cloud providers, and the different deployment options for clouds need to be understood in order to architect the right solution. Seasonal or project-oriented capacity demands. The speed of new service development requirements. All these options are viable and may be an excellent solution to your enterprises demand however there are many areas of impact on an application architecture that the placement of a workload can dramatically impact. This Impact could be mitigated by identifying the ‘Application Workload Pattern’. For example, if the workload describes what the application is experiencing. It then uses this to measure the form of application utilization, for example, the number of requests, server load etc. This is a good example of how an application experiencing this workload can benefit from cloud computing. Application performance: The performance of the application service from the user’s perspective. If an application is slow from a user’s point of view, it is now considered down. Volume of Data: All Data must move over networks, the more data, the slower the performance, the higher the networking costs, higher capacity to meet demands. Using these key KPI will simplify the decision process of application placement. Challenge 2: How do you bring consistency to the application development process. Challenge 3: Don’t start thinking about application workload placement when you are in the Technical view. The requirements of workload placement must be first defined in Business and Functional views. The Technical view further defines requirements such as the required response time (mobile access) and the decision time frame. Unfortunately all too often a technical decision such as: “We are going to use this SaaS supplier” is made before any requirements are actually defined. This can often lead to user dissatisfaction with the new system. Each enterprise is unique; constructed of unique organizational structures, products, services, operating environment and technology infrastructure. Decisions for moving business functions, services and applications to the cloud are unique to each individual enterprise. Yet, as more and more enterprises move a business to the cloud, a general pattern for progressing through this change has emerged. Historically these groups operated independently. However, they now need to be integrated into one unified force that looks at the service as a whole. It starts by all agreeing that services need to be measured at the user’s screen and not on the individual parts. The overall Application Service Manager is responsible for coordinating all parties in this decision. Appendix A of the “ODCA Digital Transformation to Cloud adoption considerations and methodology”(need URL for this) contains a set of questions that need to be considered in each viewpoint. These questions have been compiled based on the experience of many enterprises that have implemented cloud solutions. They were asked, “what had they wished they had known before they committed to a cloud solution or provider.” We recommended that you answer each of these questions as you work through your transition to a Cloud Operating model. Once all applications have been assessed, applications should be mapped to the functions they support. Assess why a cloud deployment would be beneficial for that application/ asset group/ asset portfolio, what considerations to list (such as speed to value, IT simplicity or currency, primarily leveraging the innovation or scale in the marketplace, for availability requirements, or financial drivers/ business scaling elements). Not all apps are suitable for cloud deployment or can leverage the benefits offered by a service-based model. Based on the characteristics of the application, use those to complete a rough estimate of whether the application should move to the cloud or remain on-premise, whether there is a clear-cut provider choice, and whether it would likely be refactored or not (e.g., old technology, does adequate technical documentation exist, are there SME’s still at the company, etc.). Once “why cloud” is answered, we can assess the “how to adopt cloud” question – worrying about architecture, design for failure, cloud-aware architecture, licensing, etc. Having completed the business, functional and application assessments, the analysis turns to the cloud provider(s), and whether the provider(s) is/are external to the enterprise or not. 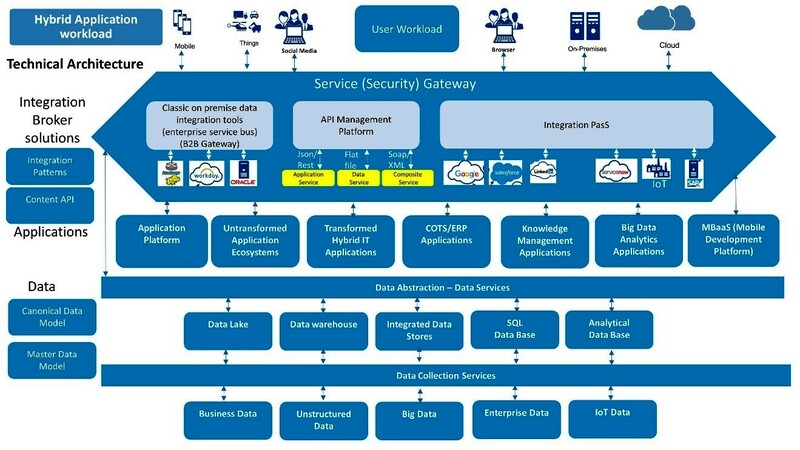 An understanding of the cloud provider(s) products and services is critical for mapping applications and services to the optimal cloud provider services. It is important to keep in mind that there are now two development teams working, the provider team and the consumer team. It is important that they are in sync else one can build over the other. The sixth step is to work through each application in the inventory to document its design; ensuring that each application’s architecture, service dependencies, technology platforms, risk and compliance posture, and operational support requirements are documented. With this detail in hand, decisions for matching a given application to a set of cloud provider services follows. This analysis should be completed for each application in the application inventory. Having classified each application for its potential move to the cloud, appropriate project management processes may then be applied to develop a migration plan and ultimately deliver the migration of selected applications to selected clouds. 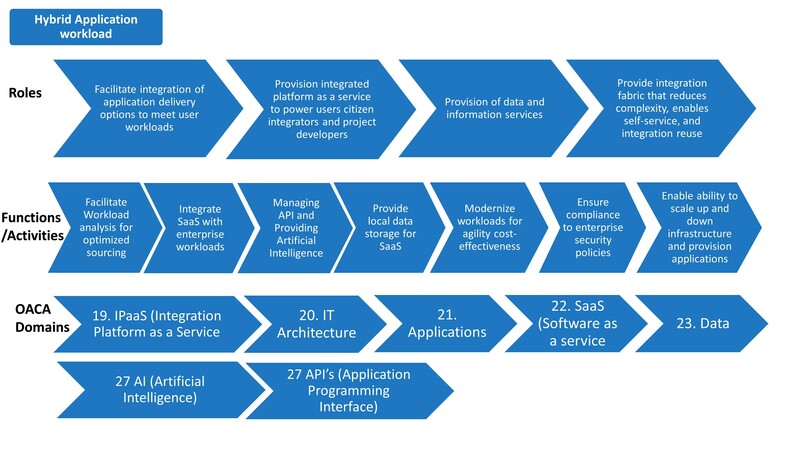 According to the migration plan, migration from selected applications to selected cloud services should be executed step by step. Eventually, the business function, which is used to be supported by a selected application, will be hosted by the new cloud services. This transfers the ongoing business function transformation from on-premise to the cloud. There are many ways to deliver services today. Two issues need to be addressed to ensure that the best application architecture is implemented. Issue #1: Favorite way: Developers become comfortable developing with specific tools. Sometimes developers do not want to try to use new tools or approaches and prefer to build applications using their favorite way. This is typical response however it is an impediment to adopting new technology. There are two ways to overcome this resistance to change. The first is to implement a compensation program that rewards those will adopt and recommend new technologies and deployment approaches. The second way is to implement a design review process step that requires all new applications be reviewed by a panel of developers to determine the best way to design the new app. This will minimize the “favorite way” pitfall. Issue#2: Lack of Knowledge or multiple variations to the design approach. Lack of Knowledge is merely a developer doesn’t know how to implement an application using new technologies. Multiple variations are caused by each developer developing an application using a different set of tools. Both of these issues are addressable using standardized patterns of use. The next area of change is to the technical architecture of the application workload. Below is an example of a technical architecture that reinforces a common Application Workload Management Architecture. 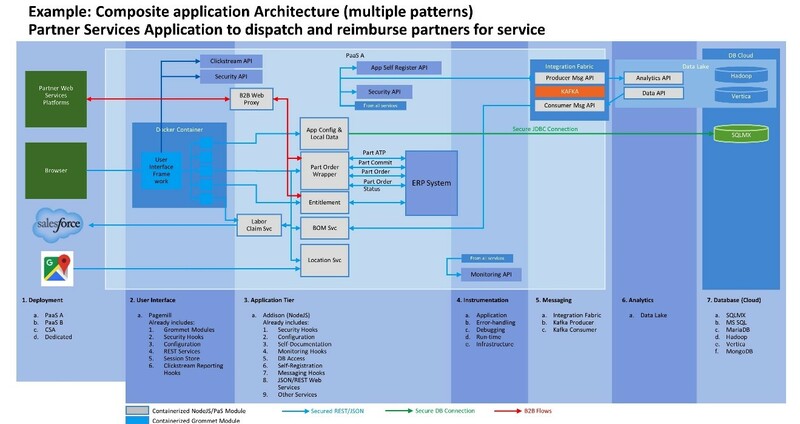 This architecture looks at an application service as a whole, not just the individual components. This architecture defines the standardized technologies that a developer can choose from to develop their new applications. In the manufacturing industry, the cost is driven down by publishing the standardized parts catalog that a designer can build a product from. This approach helps eliminate unnecessary variation in the complexity of the new product and help purchasing increase their buying power. This same discipline needs to be implemented in IT. Using this approach the overall application architecture will be more straightforward, and purchasing will have to ability to negotiate a better deal with Cloud providers. 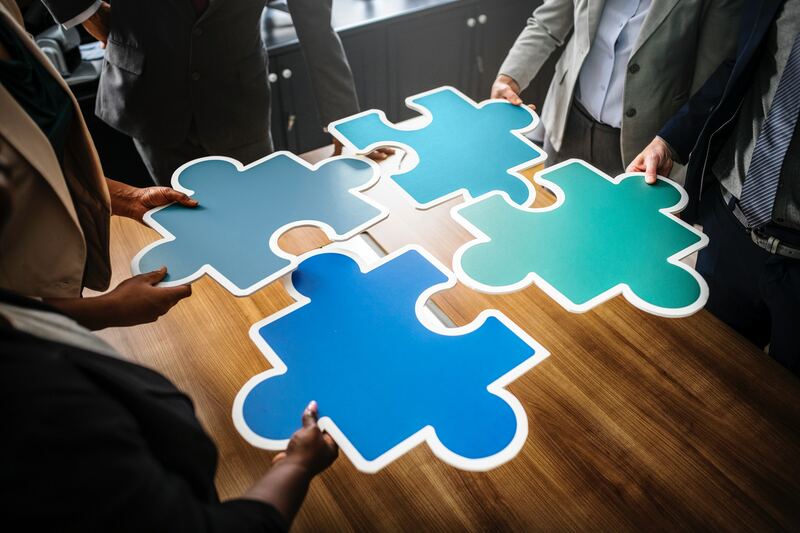 The transformation to a Hybrid shared resource Application Workload Management model requires new skills, new methods, new process steps, and artifacts to be produced by an IT organization. If done well an organization can rapidly exploit new technologies and bring new capability to market much faster than their competitors. Bill is the Digital Strategist for Liam Associates Inc. Formerly the Cloud Chief Technologist for Hewlett-Packard Enterprise Canada, Bill has provided Hybrid IT and IoT Strategic Planning advisory and planning services to over fifty Private and Public sector clients to help them migrate to a Hybrid IT Cloud Operating model. These transformation plans have helped both government and industry reduce the cost of IT, re-engineer their IT governance models, and reduce the overall complexity of IT. Bill is also a member of the Open Alliance for Cloud Adoption Team and has co-authored several documents on Cloud Maturity and Hybrid IT implementation. 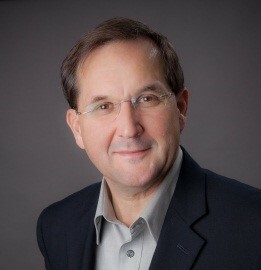 Tom Scott is currently a Principal Technology Architect at The Walt Disney Company. 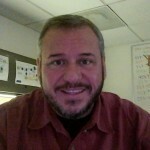 He is a future-focused technologist with over 30 years of technology innovation and experience. From being awarded a US patent for his work in mobile device news delivery to building innovative workflow solutions for broadcast television to architecting cloud solutions. He is also a member of the OACA Business Transformation Work group and has authored and co-authored numerous whitepapers and documents ranging from the published Cloud Maturity Model through Integration and Business Strategy for Cloud Adoption. As a pragmatic technologist Tom consistently implements technology that drives business.